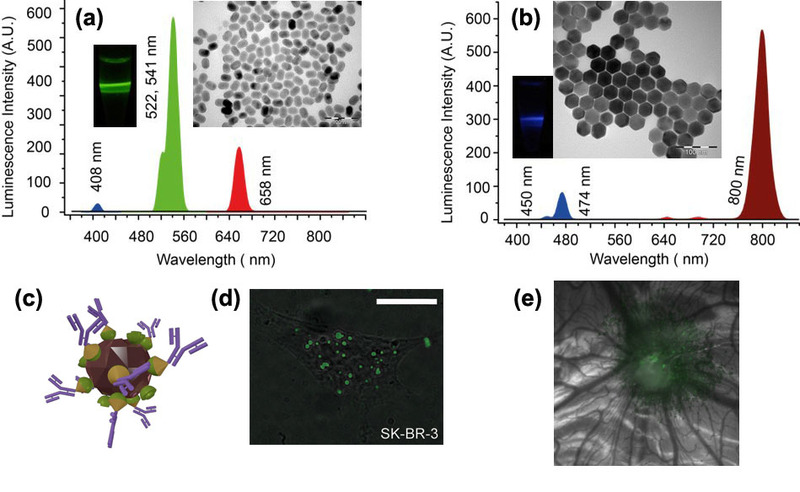 Nano-ruby represents an aluminium oxide nanocrystal doped with chromium ions whose absorption in blue and green parts of spectrum elicits emission in a narrow spectral band at 694 nm, as shown in Figure (bottom, right panel), which is a merit in optical biological imaging. 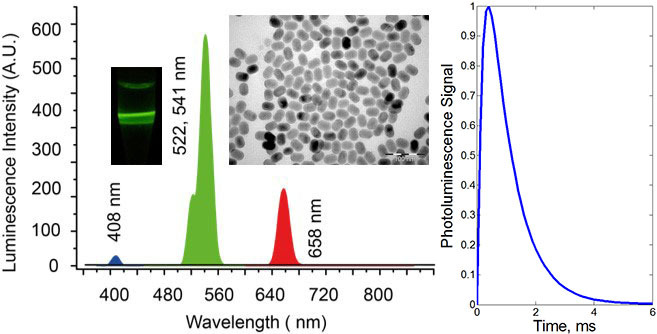 Luminescent nanodiamond also features a narrow emission line width in the infra-red spectral range, i.e. in biological tissue transparency window (wavelength range, 700 nm – 1300 nm), which makes it particularly attractive. The luminescence is originated from a crystal defect in nanodiamond formed by a silicon atom in place of the carbon atom and adjacent vacancy. Upconversion nanoparticle (UCNP) represents an inorganic nanocrystal matrix co-doped with lanthanide ions. A network of ytterbium ions absorbs infrared radiation at a wavelength of 975 nm and coalesces with thulium ions to excite these to the higher energy levels. As a result, thulium ions radiate in the blue and infrared spectral bands. The excitation process was inefficient until recently, when a breakthrough in the UCNP synthesis was heralded by much brighter UCNP particles. Luminescence from 20-nm nanocrystal is now comparable to that of a fluorescent dye molecule. The key advantages of UCNP in the context of biomedical optical imaging include the UCNP infrared emission in the biological tissue transparency window. Secondly, UCNP excitation at 975 nm elicits minimal autofluorescence from biological tissue. Also, the UCNP emission lifetime is a million-fold of that of intrinsic fluorophores that make up the biological tissue autofluorescence background. This allows complete suppression of the autofluorescence and excitation background by means of the time-gated detection. 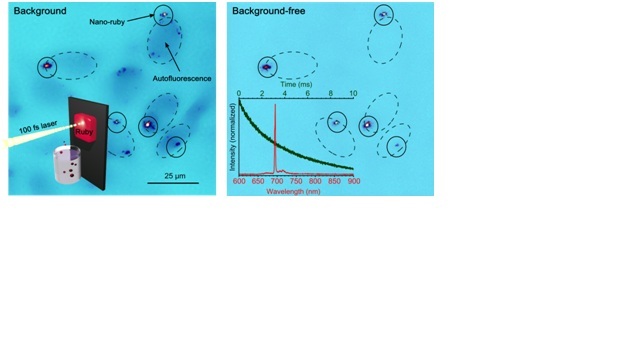 Photoluminescence spectra, TEM images and photographs of the colloids of NaYF4:Yb:Er (a), (b) NaYF4:Yb:Tm nanomaterials. The excitation laser at a wavelength 975 nm was used to acquire the spectra and photographs, where the laser path was visualised in green and blue, respectively, corresponding to the emission wavelengths at 522, 541 nm and 474 nm. (c) 3D-rendering of UCNP-based nanocomplex (brown crystallite) with antibodies (double-strand purple structures) bound to its surface via molecular adaptors barnase (cones), barstar (hemispheres); (d) Epi-luminescence microscopy of the HER2/neu overexpressing SK-BR-3 cells (grey) with target-delivered UCNP complexes (green) analogous to these in (c). Scale bar, 20 μm. (d) A tumour grafted on the chicken embryo chorioallantoic membrane, showing accumulation of UCNPs via enhanced permeability and retention effect (EPR). Figure 2. 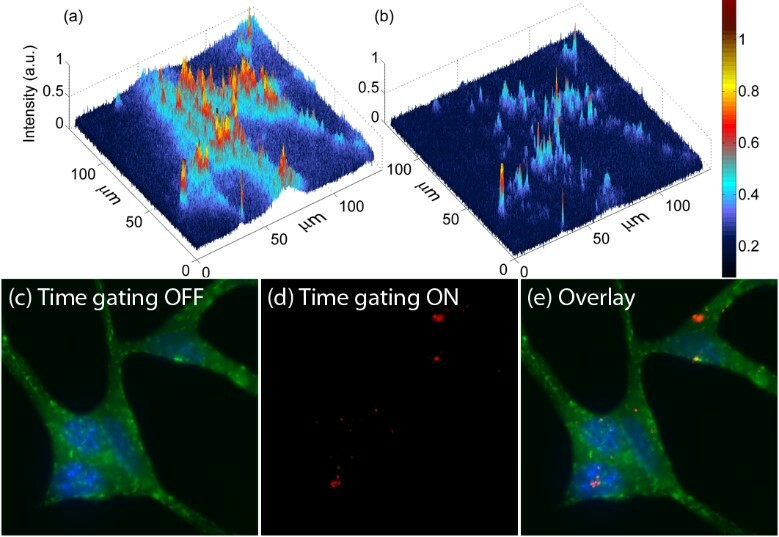 Images of cells treated with nanoruby in (a) normal and (b) time-gating modes, where only nanorubies are visible. Nanoruby-treated cell membrane were immunostained (antibody-Alexa Fluor 594) and nuclei stained (Hoechst). Epiluminescence imaging display: (c) cell membrane and nuclei (green) (d) only nanorubies, using time-gated mode; (e) an overlay of (c) and (d).